Molton Brown will launch Jasmine & Sun Rose, a new fragrance for women. Explore London via The Nile Delta. An Egyptian landscape captured in late summer s blushing dusk. Royal jasmine blooms, painted as tiny stars in a sea of fields. Faraway rose sands rise and fall like dynasties with a single brushstroke. Beguile your senses with a deltaic masterpiece. 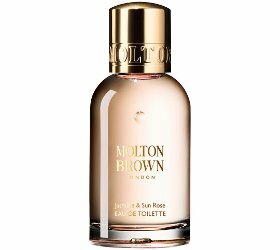 A new eau de toilette from Molton Brown, celebrating femininity with an intensely floral fragrance featuring jasmine, rose, sweet raspberry and rich patchouli. Additional notes for the chypre fragrance include bergamot, peach, osmanthus, labdanum and musk. Molton Brown Jasmine & Sun Rose will be available in 50 and 100 ml Eau de Toilette and matching body and home products. This could be my first Molton Brown. Promising notes for sure. Robin, the G&V shower gel is lovely. I’m looking forward to them releasing the fragrance (if they do). However, I do love their shower gels.